Mods: I added an extra motif onto each row. Having claimed I was going to learn to crochet for about two years, I have finally done it. I don't much care for it, but I am glad I have finally finished this; I bought the yarn immediately upon seeing the sample Cassia crocheted up at Get Knitted and it has taken this long to get round to it. Estimates suggest this may only have been a year ago, so not as bad as I'd feared. Sadly mine is not as beautiful as my original inspiration; my flowers are a bit spindly, perhaps the victims of overblocking. 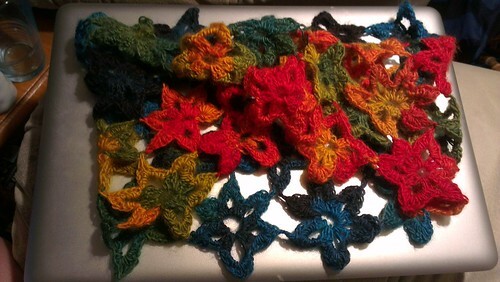 The mismatch in motif size has at least blocked out and hopefully the flowers will gain a bit more roundness with wear. I do so love the colours. This is a poor phone camera pic in artificial light but I don't think even a good picture would do it justice.